A professional race car named Lightning McQueen (Owen Wilson) gets lost on historic Route 66 on his way to the Piston Cup championship in California. After destroying the main street of the small town of Radiator Springs, he is sentenced to community service and is forced to repair the road before leaving for his race. While there, he starts to make friends, learns many life lessons and learns humility, and starts to appreciate small town life. 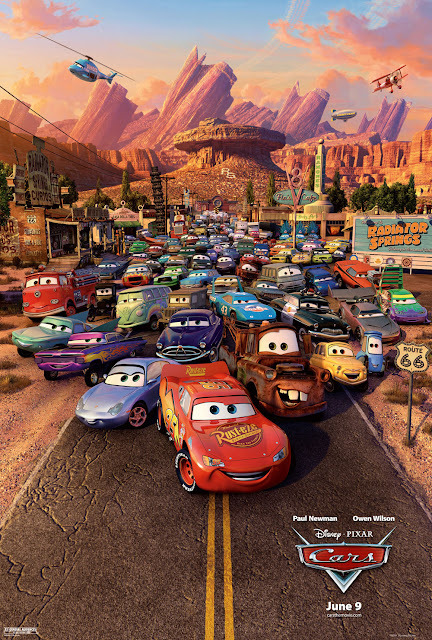 "Cars" is Disney Pixar's nostalgic homage to Route 66 and American small town life. It stars Owen Wilson as the voice of Lightning McQueen, the hot rookie race car who is on the verge of winning the coveted Piston cup. McQueen is very arrogant, so much so he thinks he can do everything on his own without the help of a pit crew or team. Little does he know he is about to learn a big life lesson the hard way when it comes to the importance of friends and humility. McQueen gets sentenced to community service after accidentally destroying the main street of the quiet, vacant, forgotten town of Radiator Springs. The one who sentenced him is Doc, voiced by the incomparable Paul Newman, who seems to come down very harsh on Lightning McQueen for reasons revealed later on down the line. Doc might have more in common with McQueen than he cares to admit, but he is determined to make McQueen learn respect and modesty, even if it kills him. This Pixar movie boasts a solid voice cast including the aforementioned Newman, Larry the Cable Guy (who was probably at the peak of his popularity when this film was released), Bonnie Hunt, Michael Keaton, the late George Carlin, Cheech Marin, Tony Shalhoub, and of course, John Ratzenberger, just to name a few. This voice cast is really great. Everyone involved in this project fits their respective automotive counterpart very well, and because the voice acting is so good, it elevates the experience of "Cars" for us just a little bit. The film looks fondly at life away from the big city. It draws attention to the charm and culture that died when the economy of many small towns crumbled after the Interstate replaced Route 66 as the main thoroughfare. It laments the loss of these little tourist stops in favor of eight lanes of high-speed travel. We appreciate this sentiment, but as two people who grew up in a big city, we both agree this might be difficult for little city kids to identify with. There are quite a few laughs throughout the film, many of which are delivered by the blissfully ignorant Mater, voiced by Larry the Cable Guy, who is charmingly sweet in this installment. The car puns start early on and never stop coming, so if you don't like this type of humor, beware, there's a lot of it. A little bit of the humor is more kid-centric, like gags about cars leaking oil in an attempt to equate it with urination, but they still managed to get a chuckle or two out of us. There are also some cute touches done by the animators, too, such as the flies actually being Volkswagen bugs. We love this sort of thing! Pixar was on a roll for many years and took a small step down with this attempt. Most likely anyone will tell you "Cars" is far from the best Pixar film, but if a 7/10 from us, a 74% critic rating from Rotten Tomatoes, and a 7.2/10 rating from IMDb means it's not the best, we're sure the company will be more than happy to take these pretty dang good numbers. Its predictability might hinder the enjoyment for some adult viewers as it travels down a road we have seen many times before. It doesn't quite have the depth of emotion we typically expect from a Pixar endeavor, and while we agree that life isn't about the destination, it's about the journey, this is far from their most spiritual trip down the road of self-exploration. It's still a fun watch, filled with fantastic music, brilliant colors, crisp animation, and some excellent jokes and car-related puns. In this respect, it's a lot more fluff and a little less substance. It is very kid friendly in that it doesn't have more mature themes, but regardless, it's still a solid film. One year ago, we were watching: "Tomorrowland"